Synopsis: London, 1882: Queen Victoria appoints Harold Spire of the Metropolitan Police to Special Branch Division Omega. Omega is to secretly investigate paranormal and supernatural events and persons. Spire, a skeptic driven to protect the helpless and see justice done, is the perfect man to lead the department, which employs scholars and scientists, assassins and con men, and a traveling circus. Spire’s chief researcher is Rose Everhart, who believes fervently that there is more to the world than can be seen by mortal eyes. Review: The cover and the summary immediately attracted me as soon as I saw them and I really could not wait to get into the story. I must say that I love the novels from the Victorian era and mixing it with paranormal elements could only please me. Yet I confess that in the end I’m a little disappointed by this volume, but I’ll come back a bit to that afterwards. 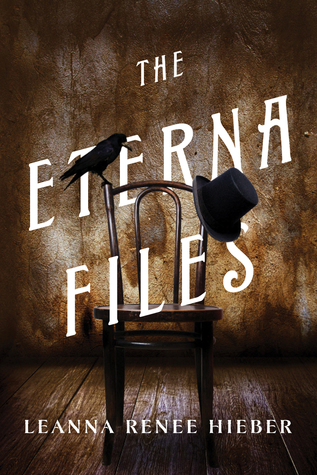 After the death of Abraham Lincoln, Clara and her guardian, Senator Bishop, a man she likes a lot, have put together a team together to try to find the secret of immortality, a compound called Eterna. For years, researchers have tried to find the solution and the arrival of Louis changed that. This scientist has also a hidden story with our beloved Clara. But one morning, our heroine learns that the whole team is dead except one person. The young woman is therefore launching in a race against time to find Eterna, all with her friends. But Clara is not like any other women because she happens to have visions and sees things that no one else is able to do. Alternatively, we also follow Harold, a man who does not believe in the supernatural world and who is engaged by the Queen of England to lead a team of very special people. Their goal is to find Eterna for England and to prevent Clara and Americans to recover it before them. Many characters are highlighted in this story, some more interesting than others elsewhere. I admit I was a little lost about some of the protagonists, not really understanding who they were. But the volume especially focuses on Clara and Harold, two completely different characters. Clara is a young touching woman. We know that she has lost her beloved, but because of their secret relationship, no one knows that, and she keeps her feelings for herself. She is determined to understand what had happened to her lover and to recover Eterna if it does exist. I admit that I was passionate about her character, to understand and discover how she was going to resolve everything. Conversely, I have not been very interested in Harold and his chapters. This is a man who does not believe in the supernatural world, but he is determined to carry out his mission. It’s quite a shame, but I found his chapters rather flat and I rather looked forward each time to return to Clara. To conclude, I spent a good time in general with the novel even though the history of the England side interested me less. However, I am curious to see what will happen afterwards to our dear Clara who must cross one of many trials. This entry was posted in Leanna Renee Hieber, Mystery. Bookmark the permalink. Loving the cover, I can well see how it attracted you to the book, it’s just a shame that the book wasn’t all you’d hoped it would be. That’s unfortunate. I see a lot in what you’ve mentioned that had the potential to be great. Is this a series, by any chance? If so, is it possible that it might improve in the subsequent books to follow? I don’t know yet if it’s a series but I think so. We’ll see. I was curious about this book. I’m sorry that you were disappointed. Sounds like it was mostly Harold’s fault. I like the sounds of the premise. I hope book two is better. I typically struggle with books that have multiple POVs because inevitably I prefer one over the other and then spend all my time rushing through the other chapters to get back to the character I like better. It’s too bad Harold’s chapters were like that for you, but I’m glad you were a fan of Clara! Yes me too but it’s mainly the 2 characters… it’s just all the other ones. I agree with the others, it does have a great cover and I would have picked it up for that alone as well! Great review. I am glad you are curious enough about this to want to pick up the next one even if parts of it you didn’t care for. LOVE the cover! Ugh, shame his perspectives were flat, but at least hers wasn’t, right? I’d probably be bored with the history of England side too, haha. I do love the cover, but I probably wouldn’t pick it up as it isn’t a genre I like to read. It’s unfortunate that you didn’t enjoy it as much as you wished, but maybe the next book will be better! The minute you mentioned ‘Victorian era and mixing it with paranormal elements’ immediately caught my attention. This sounds interesting, and I’m glad you enjoyed Clara’s character and the story for the most part. yeah I always love such a mix. It’s always a shame when a beautiful cover attracts you to a book but than it isn’t all that you hope it to be. Hopefully you enjoy your next read more Melliane! I think the cover is outstanding, but the story sounds like it misses the mark a bit. I read another book by this author and I struggled a bit with it as well. ah sorry to hear that. I felt that much of the book dragged until it got to the supernatural parts. I love this author’s writing so I will probably read the next book but it wasn’t what I was expecting. I think we are pretty close on how we feel about the book. I’m curious to see your review. sorry it was the same for you. I must admit that the blurb is pretty great. Too bad the story isn’t. Although, you still enjoyed it, so that’s what matters in the end. 🙂 Wonderful review!! I’m most curious to read this too, a blogger friend said it’s gaslight fantasy? I don’t think I’ve read a book from this genre before so i want to give it a try. Hopefully I’ll find it enjoyable. I don’t know what gaslight fantastic is. Oh Mellanie I was just hoping to read that story measured up to that cover. But who knows, maybe the audio can bring the story up a notch for me, sounds really interesting to me. I’m adding it to my waiting list. I hope so for you. I would be curious to see what you think of it. The cover is catching my attention too! I like history in my books. Oh I recently read this one too. Agreed with your thoughts and rating. I thought I would like this one more, but in the end the story was a bit rambling and too disorganized. I wasn’t very interested in the British side perspective either. I mean, they were supposed to be investigating Eterna but mostly they kept following up on some other case, and it wasn’t until the end you even got any of the connection. Sorry to see you had the same feeling but yeah… exactly, I agree with you. I’ve read this author before,D., and I know she takes some time to get used to. She is very Gothic. Glad you enjoyed it! yes the style is interesting but difficult thing between the two parts.